OPEN SEASON: The Open Championship, which happens to be my favourite major, is being played this month at Carnoustie. And that means we will be hearing more about Jean van de Velde’s exploits there in 1999. I don’t think I will ever forget the sight of van de Velde, with his pant legs rolled up, wading into Barry Burn. If you’re like me, you may have forgotten who eventually won that ’99 Open. It was Scotland’s Paul Lawrie, who beat van de Velde and Justin Leonard in a playoff. I had the opportunity to meet van de Velde two years later when he played in the 2001 Air Canada Championship at Northview Golf Club in Surrey. The Frenchman was simply one of the nicest people I’ve encountered in many years of covering golf. In case you were wondering, he shot rounds of 72, 69, 72 and 67 and finished tied for 37th at Northview. He cashed a cheque for $14,960. OH CANADA: The RBC Canadian Open will be played the week after the Open Championship, which is definitely not ideal. But tournament organizers have landed some nice names for this year’s event, which runs July 26-29. Back-to-back U.S. Open champion Brooks Koepka, world No. 1 Dustin Johnson, Bubba Watson, a three-time winner this year, Tommy Fleetwood and Tony Finau are among those confirmed. Johnson is a member of Team RBC, so his spot in the field was virtually guaranteed. Other prominent Team RBC members who will be in the field include Matt Kuchar, Jim Furyk and Brandt Snedeker, as well as British Columbians Adam Hadwin, Nick Taylor and Jared du Toit. The only bad news about the Canadian Open: it’s being played again at Glen Abbey. 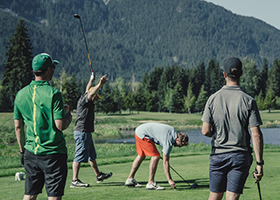 AMATEUR HOUR: The month of June in British Columbia was all about pro golf as Vancouver, Victoria and Kelowna all played host to events on the Mackenzie Tour-PGA Tour Canada circuit. As for July, let’s call it Amateur Hour. Big amateur events -- provincial and national championships -- are being held this month in virtually every corner of the province. The B.C. Amateur Championship, a tournament with a rich history that dates all the way back to 1894, will be played July 10-13 at Rivershore Golf Links in Kamloops. Rivershore, one of only a handful of Canadian courses designed by the prolific Robert Trent-Jones Sr., should be a wonderful host site for British Columbia’s premiere amateur event. The B.C. Women’s Amateur is being held the same week at Golden Golf Club, which is truly one of this province’s hidden gems. The B.C. Junior Boys and Girls Championships kick off the month, with the boys playing Kamloops Golf & Country Club and the girls competing at Kimberley Golf Club. Those tournaments go July 3-6. There’s more. B.C. golfing legend Doug Roxburgh will defend his B.C. Senior Men’s title July 17-19 at Big Sky Golf Club in Pemberton. A couple of national amateur events will also be contested this month in B.C. The Canadian Women’s Amateur goes July 24-27 at Marine Drive Golf Club in Vancouver. The Canadian Junior Girls Championship starts July 31 at Beach Grove Golf Club in Tsawwassen. BEST WISHES: Sportswriters aren’t supposed to care about who wins or loses, but I find myself rooting for Nick Taylor. The 30-year-old Abbotsford pro is going through some tough times and needs a positive finish to the PGA Tour season if he is to retain his exempt status. Taylor missed the cut at this past week’s Quicken Loans National in Potomac, Md. He has now missed the cut in nine of his last 12 starts and fallen to 124th on the PGA Tour’s FedEx Cup points list. The top 125 players on that points list retain their exempt status for next season and also qualify for the FedEx Cup playoffs. If Taylor falls out of the top 125 he will have to play in the Web.com Finals to try and regain his full status. Let’s try and send some of that good B.C. golf karma his way.